MMOs: A new fling, or more? I’m in my 3rd week of playing Final Fantasy XIV. It’s sort of like a dirty little MMO secret of mine. I don’t know how to feel about it. Here’s my long-winded story of how this came about. In early March my SO had an accident while she was out riding. She fell off her horse, landed on her right foot, and pretty much broke the ankle the worst way you can. Open fracture of the ankle. She immediately went into surgery, and had second surgery a week later, to fixate the bones using screws and a metal plate. All thoughts of raiding in WoW or playing MMOs went straight out of my head, as I juggled between work, hospital visits and taking care of three particularly needy cats. At home I mostly lay on the couch and watched Netflix. On top of that I had an Internet outage in the first week of this whole ordeal. As often happens, a forced break manages to cure me of the habit that WoW often becomes for me. It happened like that during the Christmas raid break in 2013 which initiated my 10 month break from WoW. It’s happened now. My reasons: I really don’t find garrison play compelling, there are no reasons to leave the garrison for character progression, and I currently don’t have time to commit to raiding. What else is there to do but legacy raids (been there, done that), garrison missions and raiding? Nothing that I find remotely meaningful. But of course there’s still the MMO itch. It never quite goes away. And multiple times recently, people I highly respect would break into praise of one game: Final Fantasy XIV. It never caught my eye because I haven’t played a single FF game in my life, so I am not attached to the IP at all. Also, I have zero affinity to JRPGs. But people praised it. There’s Belghast, the poster child for being enthusiastic about his MMO of choice. There’s Syl. And Liore. Plus @stoppableforce, and so on and so forth. A common theme in their praises was that people in FFXIV are incredibly nice and polite. Furthermore, people praise the large amount of content that’s available. So I tried the trial version. It was charming. I had fun. The full game was 10 bucks on Steam, with a free month of gametime, and I decided that 10 bucks was perfectly fine to see more of the game. I joined Belghast’s guild aka free company, Greysky Armada, home of apparently all the MMO bloggers in the world. My little Myqo’te lancer is adorable, yet fierce at the same time. Also, did I mention she’s cute? I mean, look at her? Totally not my usual style, but sooo adorkable. And so I have been drifting around this game, enjoying the various sights and this MMO experience that is the closest I have ever come to feeling like I am playing a vanilla WoW again. This is both a good and a bad thing. The bad things first: The quest experience is not awesome. Most quests are very simple. You kill 10 rats or you gather 10 doodads and hand them over (in a kind of annoying interface). Many fedex quests. There’s been one quest chain, the seasonal Easter event, where you turn into a spriggan and get a kind of vehicle or pet bar with different abilities. Really, compared to WoW the quests feel very…well, vanilla. Furthermore, you spend a lot of time running around. I started in Gridania, one of three capital cities in the game, and you spend a helluva time running back and forth between the first zone, Central Shroud, and Gridania itself. Once you progress beyond your capital, your main story has you visit all capitals in turn, to return back to some remote place where your band of heroes has its headquarters. Really, you spend a lot of time running around. It’s like the horde Onyxia chain come back to life. 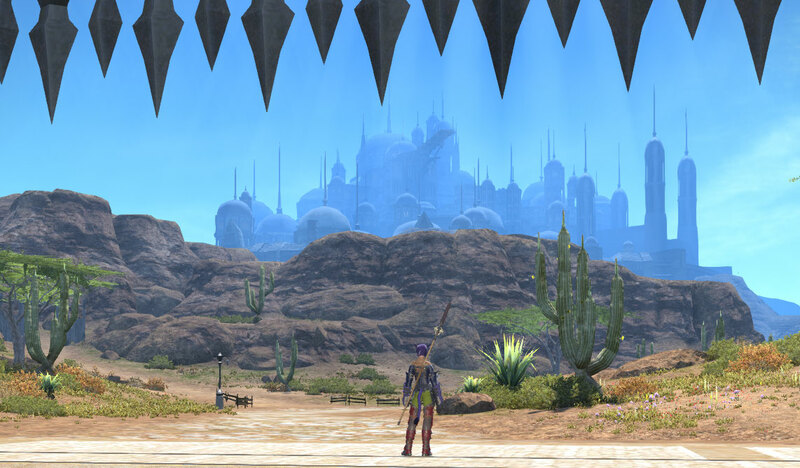 Enjoy the sweeping vista of Ul’dah, the desert capital. On one of my many runs from Horizon to Ul’dah. The good things: Character progression. Not only do you level, but your character’s main story is the star of the show. In Final Fantasy XIV you have main story quests that guide you through the game. They teach you basic game mechanics and also advance the story. Whereas in WoW you work for the shining stars of game lore, in Final Fantasy XIV your character is the main star, the one that awes all other characters in lore. I don’t think we’ll ever experience a Garrosh and Thrall moment in FFXIV. The main story quests pretty much gate your content. Remember all the attunement discussions WoW still has? I am still firmly on the side that liked attunements. FFXIV is full of systems and such that you need to unlock to progress. Currently I am working towards unlocking my first mount, the famous chocobo. Let me tell you, I really dig that I can’t just ding 20 and run to the next vendor. I need to work towards unlocking the mount with a quest chain. But first I need to choose the grand company I like best, so basically, which faction’s hero I want to be. I am leaning towards the pirates of Limsa Lominsa, they seem the most fun. The mount being locked behind quests reminds me of grinding stone elementals in Arathi Highlands to be able to buy my first mount, at level 42. It took me two levels to actually grind the 100 gold back then. I dig it. I really do. It gives me a sense of character progression that I haven’t had in years. Probably not since TBC. There are more things like that in the future. You have to work towards getting a job, which is what you would call a prestige class in D&D and Pathfinder. You can work towards a relic weapon, like a legendary and it requires lots of work. And so on and so forth. I can confirm the stories that people are quite nice in FFXIV because hello, forced grouping. To progress through your main story, you are frequently sent to dungeons, which are 4-players (tank, healer, 2 DPS) in this game. LFD is called Duty Finder here. As an aside, it is here I am seeing my biggest issues in-game. Waiting times are already quite meh during my playing time, because, you know, US server, something I never ever wanted to do again. Anyway, in quick succession you are sent off to all 3 beginner dungeons, and they’re really easy. My biggest problem was that as first time player, you get the main story cut scenes, but the others are moving on, and most boss encounters lock you out after 15 seconds. I’ve watched one boss battle from outside but the tank was super apologetic that he started the encounter without waiting. Being stuck in cut scenes also means being unable to hand out player commendations, which is a currency that you can give out to one player per dungeon at the end of a completed run for being a good player. Wipes can still happen, and yet I still have to see a group falling apart. Most runs, people say hello to each other, politely, and when things don’t work people discuss how to improve. This was the most obvious in my first trial, which is a specific story encounter where you have to kill a primal, and there’s not even loot. As far as I could tell, only 2 people, the DPS, needed to kill the primal for the story. One of them was me. The tank helpfully explained the fight, which is a DPS check. Don’t stand in the fire, and when a nail drops down, kill it as soon as possible before the boss jumps in the air, or it’s an insta-wipe. What can I say, the other lancer and I, we did not have the DPS to get the nail down fast enough. For level 20, I thought it was a very tight DPS check. I was the lowest level there, and I felt bad, but no one left. In the fourth try, the healer asked the tank to help kill the nail, and that she would heal through the cleave damage us lancers would be taking. Voilà, that did it, Ifrit went down. I am sorry, but I don’t see anything like this happening in WoW anytime soon. So that’s where I am right now. I play very casually, an hour here and there, with many afk breaks inbetween, and a little bit more on weekends. I have an abundance of content as I am of course coming in now that FFXIV is bound to get its first expansion in June. But that’s okay. I have to level to 50 first. Unlock all the things. Work on the hunting log. Try more classes. Did you know that in FFXIV you can play every single class on one character? You basically eliminated the need for alts beyond aesthetic reasons, because if you are willing to level them all, you can be everything, and switch by changing your main weapon. You can be the tank, the healer or a DPS, rolled into one person. Additionally, there is no limit to any of the crafting or gather professions, and you level them all just like a class. 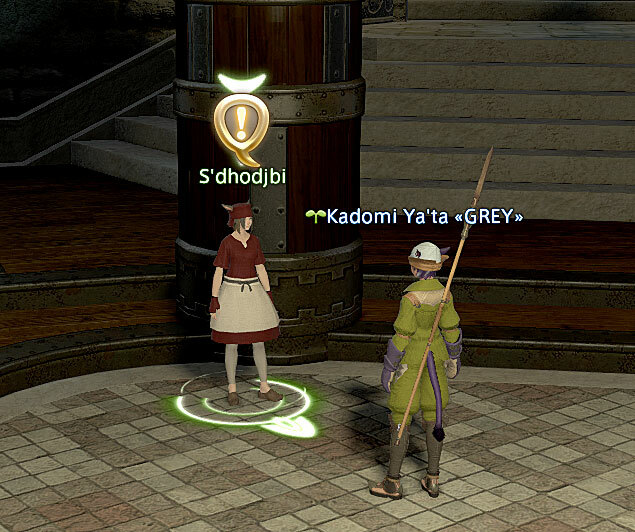 I play Kadomi Ya’ta on Cactuar, currently a level 21 lancer, level 1 marauder, level 18 carpenter, level 17 botanist, level 14 miner, level 14 armorer. I spend evenings chopping trees, and I have no regrets. If it wasn’t for the quest icon, I would think she’s one of the many many gil sellers, hah! Now let’s see how long it can hold my interest because since my wild love affair with Wildstar I am very careful with declaring my love for another MMO. If you wish to, you can skip the cut scenes and watch them at your leisure later in the Inn (there’s a Journal there that will replay every cut scene you’ve ever been in.) Hitting Escape will skip the scene. If you haven’t already found it, there’s an option to skip cut scenes that you have already seen (or skipped) once before. There will be some high level story dungeons where you will WANT to skip the cut scenes, because there are ten or so, they’re very minor, and you’ll drop into them one after another because the rest of the party is moving on and running over the trigger points. 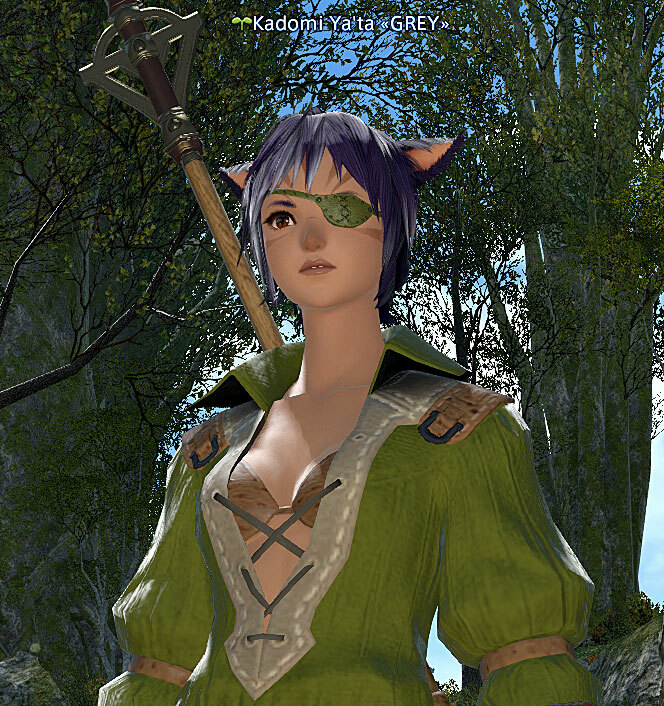 I also have an alt on Cactuar when I’m tired of high level stuff and want to revisit the story: Pahja Tayuun, currently a Conjurer. Rolled her to try out a new look for my main character, decided to keep playing now and again! To go with cutscene skipping, if you don’t want to skip them and experience them as you play, you’re better off with Party Finder and forming a group that way. Also, I reccomend reading all the text – even tool tips if you are interested in the story. And, don’t forget to go to the Gold Saucer! Even if you aren’t big into minigames, one visit should at least be on your radar.